You’ve certainly got a lot of choice. The Andes mountains, Ladislao Biro – inventor of the ball point pen, gauchos, writer Jorge Luis Borges, the tango, Eva Peron, rugby player Hugo Porta and Maradona to name but a few. However, in current football terms, if you were asked the same question, chances are many of you would plump for Lionel Messi. We would too, which is handy seeing as we are giving you a chance to win a pair of signed Lionel Messi football boots. We’ve got a pair of the Argentine international’s Adidas F50’s, signed by the young superstar and ready to go to a new home. To enter this great competition all you have to do is purchase any item from the Footy Boots Shop and your name will automatically go in the hat. There’s no minimum price rule, and the competition is open up until 10th December 2008. And, if you feel the need to go back and make further purchases, your name will be entered in to the competition as many times as you flash the cash. messi you are like the best football player in the world and i realy wish i was like you. 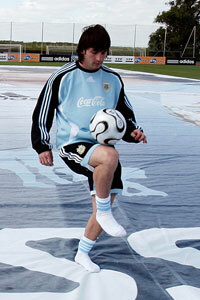 I think messi is one of the best Argentinian players after Maradona he is my favorite player in the world!!!!!!!! Lionel Messi Great from CR7(Cristiano Ronaldo). you are the best player in the world, and are mch better than chritiano ranado is. the only reason why people like him is because he is fast and can take good freekicks, but i khow you can do that better than he can. hello my name is timothy , I live in Germany , you are my favourite star…..
Hi my name is Nova and I really play like Lionel Messi and Messi is my all time hero ever. from South Africa in Eastern Cape(Stutterheim). I wish I could meet you and hold your hand so that I could gain your quality of football megic!! 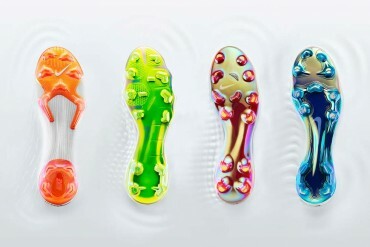 Messi is a football god and i really love to play like him.I really love football and i play the game very well but i do not have boots so i really hope to win this boots.BRAVO Messi you are the man with golden feet.